THE LADYBUG, A GRACEFUL INSECT, CAN NOW BE ADDED TO THE STANDARD HIVE SET! 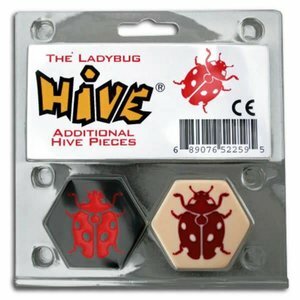 THE LADYBUG CAN MOVE THREE SPACES AT A TIME, TWO ON TOP OF THE HIVE THEN ONE DOWN. IT CANNOT MOVE AROUND THE OUTSIDE OF THE HIVE AND CANNOT END ITS MOVEMENT ON TOP OF THE HIVE. IT CAN, HOWEVER, MOVE INTO OR OUT OF SURROUNDED SPACES THAT MAKE THE LADYBUG MUCH FASTER.